Not many artists have consistently improved their music as well as David Wahler has over the course of his six albums. I knew, when I reviewed his debut, Antiquus, that I was hearing a special talent, but when I started listening to his latest, Mosaic, I was struck at the advancements he had made in every aspect of the recording: composing, refinement of instrumental sounds, production quality, emotional depth of the music, and his overall growth in artistic maturity and self-assuredness. I will pay him the highest compliment I can pay a new age style music keyboard player: When I first heard the opening title track on Mosaic, I thought, "Holy cow, he sounds like Kevin Kendle!" Anyone who has followed my reviewing arc knows the level of esteem I hold Kevin Kendle in, so comparing Wahler to him is about as good as it gets. Now, David Wahler is not imitative in any way, but the quality of the sound sculpting, the beauty of core melodies, the flawless production quality, and the excellent assortment of keyboard sounds—all of them spot on—all add up to the same "formula" for success that Kendle has mined for years and years. Mosaic travels a road that crisscrosses an assortment of relaxing styles but it's not in any way a CD that doesn’t play all the way through superbly with a single mood. However, the subtle shades of tone and texture are where Wahler excels, whether piano takes the lead or a more electronic instrumental element does. The harp plucks on the title track over a soft cushion of tones, woodwinds, muted chorals, and strings instantly transported me to a sunny hillside in the countryside. Sprinkling bells, birdsong, and mellow tonalities are married to lilting flute on "Afterain," and "August Cloud" is appropriately drifting in nature with ebbing/flowing ambient textures underneath a minimal piano lead. "Heading Home" bring a more pronounced reliance on piano to the forefront, although still in a quasi-minimal vein, buffeted gently by subtle shimmering shadings in the background, and the piece evokes contentment and relaxation. By mixing things up and sometimes letting the piano lead the piece (e.g. "A Promise to Keep") or bring keyboards to the forefront (the vocals, plucked harp, and whistle on "Elysian Dawn"), what impresses consistently throughout all of Mosaic is the attention to even the smallest detail (for example, on the aforementioned "Elysian Dawn," the inclusion of birdsong is just the perfect embellishment for the titular evocation). With all the pieces that are to bear on the album, I have to believe it took an insanely long time to record (but, on the other hand, since I am not an artist, this is just my informal assessment). When I hear the blend of forlorn piano and twinkling tones at the onset of "Lone Sky Night" followed by classic new age keyboards later, I just marvel at how everything fits together so well. Maybe that's a unconscious – or conscious - by-product of the album's title? David Wahler has succeeding in taking the best elements from the earlier days of new age music and bringing them into the 21st century, creating relaxing soundscapes that remind me of the golden era while making me excited about what is yet to come in this genre. 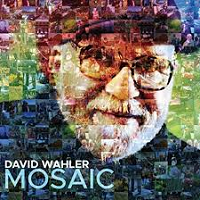 Mosaic is not just David Wahler's best album, it is one of the best "pure" new age music albums of the year.